Tell Me More About St. Pat's : Tell Me More I then tried to find something multicultural and spicy, like a Latin band that plays Irish folk music, or an African band that plays Irish folk, or an Irish ban that plays African music, or something like that. Happy St. Pat's (or as my friend Will calls it, amateur drinker's day). We were trying to figure out a way to acknowledge the day. 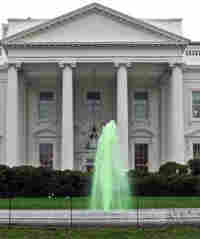 I wanted to do a piece exploring Obama's Irish roots, but everybody else shouted me down. They were all, "so what?! ... don''t you realize we have a recession going on here?" So I received no love. I then tried to find something multicultural and spicy, like a Latin band that plays Irish folk music, or an African band that plays Irish folk, or an Irish ban that plays African music, or something like that. Again, no love from my people here. What can I say? You'd think I'd have some say around here, and I do, but it's not a dictatorship. ... And it's not like they just come out and say no. They just kind of star at me ... like I'm a patient. One DAY I will be QUEEN! But you know what? We did have THE QUEEN (of soul) in the house. And, yes, you can hear more from Aretha Franklin tomorrow. Read White House talking points (pdf) regarding the president's mortgage/foreclosure proposal. And here's more information about the Nurse-Family Partnership discussed in today's parenting segment. Just for grins, read the actual transcript of the president's speech yesterday, where he bawled out the AIG executives. And here's his speech to the Joint Session of Congress where he mentioned a number of these ideas, including his idea for home visits to support new, low income mothers.